While we’ve all loved following our favorite designers on NBC’s Fashion Star this past season, we probably haven’t stopped to think about all of the hard work that goes on behind the scenes preparing models for the runway, and specifically, who does it. Los Angeles native makeup artist Julianne Kaye was honored to be the Official Maybelline Beauty Expert for the first season of Fashion Star. After working with Maybelline in the past, she was offered the position and happily accepted. Though there’s no word as to whether Maybelline will be returning next season, Julianne sure hopes she can be the Beauty Expert again! JK: It’s something that has always sort of been in me. My dad, he came from England. He was a really good hairdresser actually back in the 50s. He did hair for Rita Hayworth, Diana Ross… so I grew up in a salon environment. I was there all the time. And my mom was a clothing designer from New York. So I’ve always had an artistic part…it was really around me a lot.. I knew I didn’t want to be a lawyer or doctor, that’s for sure. One day it just clicked…I loved makeup and I loved painting and I was like “I can make a career out of this!” So I did it! I started when I was 19. How did you make your way into the business? JK: The first five years were really hard. I was doing movies, actually. I started off doing special effects and wasn’t really making money, but it was really difficult. About five years into it, I met a makeup artist that I started to assist and she was working at these really big, glamorous jobs. It literally fell into my lap…she was like “do you want to go on tour with Britney Spears?” and I was like “yeah!” So that was a big transition for me as far as going from films to working with the biggest pop star in the world. So that’s how it happened, but I definitely paid my dues. It was a long process. What's one piece of advice you would tell an aspiring makeup artist? JK: I think it’s really important to understand that this is a business. It looks glamorous and all that, but a lot of hard work goes into this. It’s a career. I think it’s important to know a lot about makeup and makeup history and know everything about it. I also think it’s really important to assist people, like really good makeup artists, so you can get a lot of information. Everyone has their own style, so it’s important to gather as much information as you can and just work on your friends or anyone you know! Hands-on experience speaks volumes! What does being the Official Maybelline Beauty Expert for NBC's Fashion Star entail? JK: I have a team underneath me, and it’s basically like a really amped up version of any runway show that you’ll see. My job is to consult with the designers and they have small collections. They would have three items of clothes and we would look at that and talk about what they were going to do with the hair and what we were going to do with the makeup. We would have a collaborate vision. It was so crazy backstage that I didn’t have time to demo the looks. I just told my team what we were doing and we just tapped them out as fast as we could. How did you become Fashion Star's makeup artist? JK: I had done a couple of things with Maybelline in the past and it came to the attention of my agent that a primetime show was looking for a makeup artist. That’s all I knew…it was a reality show and Maybelline was looking for someone. So it was a lot of back and forth, and like I said I’d done a couple of things for them in the past, and they really just liked the way I spoke and what I did, so that’s how I got the job. It was a great day, trust me. I was like "WOW!" Will you return to Fashion Star next season? JK: You know, I’d really love to. My agents are in talk with Maybelline right now…I’m hoping that things happen. I don’t even know if they’re coming on board again for the second season. I hope so! I’d love to do it again. It was a really good experience, but I don’t have any word yet. JK: I have so many…for me, Armani makeup for skin. I just love the Armani foundation Luminous Silk. So I’d say for skin, Armani. For pops of color, great lipsticks, Maybelline is fantastic. And they have these new Eye Studio Tattoos, which I’m just absolutely in love with. They’re full-colored cream shadows and they work really well. I love YSL [Yves Saint Laurent] Touche Brillance Sparkling Touch for Lips, they’re amazing. You click them and they have like diamonds in them. There are things that I really love in different makeup lines. I also think Makeup Forever is like the new MAC. They’re much more innovative with their color. What makeup do you wear when you're just hanging around the house? JK: For me, personally, because I have two kids, I don’t really have time to be all glamorous. But there’s one thing I do wear everyday and that’s mascara. It’s that one thing that you can put on that really changes everything. For lips, Maybelline Baby Lips Lip Balm...they’re great! You can put them on your checks and they add a little bit of a glow. Or you can put them on your lips...they’re easy to pat around to keep your lips nourished and looking good. Schiap is an awesome magenta color from NARS that looks great on lips and cheeks. So a lip balm and mascara, especially for college girls…it look like you spent a little time, but not too much. How do you do your makeup if you're going out? JK: The quickest way, if you’re in a hurry to go out, especially for this season, it’s really about the full lip. Fuchsia is one of those really underrated, bright colors that I think everybody should try because purple falls into the color warm and cool. So it’s one of those universal colors that I think looks really good and is on trend, and it’s bright, and it’s super quick! If you’re really all about the smoky eye, I think a good thing to do is just get a really good eye crayon and line the water line, line the top, smudge it with your fingers, and you’re good to go! What celebrities have been the most fun or memorable to work with? JK: I’d have to say Britney Spears was pretty pivotal in my career. I have lots of really good memories of that. With her, I was so young, and I got to see the world. I went on world tours with her. We just really had a blast. A lot of my good memories are from that time of my life. Do you know who I worked with who was really, really cool? Gisele Bundchen, I absolutely love her…and Kate Hudson. Kate Hudson is like the biggest breath of fresh air. Both of them are just really cool…chicks that you’d want to hang out with and go out with. Why did you decide to create Revolutionbeauty.com? JK: People ask me questions all the time about things I like and this and that, so the blog is just another outlet for me. When I get products, I like to talk about them. I really would love to see it grow and make it even bigger and more informative for people because I really do think that everyone wants to know how to look good. So that was always my intention. Why did you decide to write your book Pop Tart? JK: I always wanted to do a novel ever since I was little. And when I met Kira [Coplin], she’s a writer and used to work for Us Weekly, we just sort of hashed out the ideas. We were sort of laughing at all the stuff…all the big disasters. There’s so much that goes on behind the scenes. So we just came up with the idea to do a book and see what happens. And we were lucky enough to get published, which is amazing. That’s how I formed Pop Tart…just another outlet. Did the novel have the reaction you were hoping to receive from readers? JK: Of course my friends that read it, they get it because they know some of those are my stories. I think other people were sort of misled when they read the book. I don’t think people really got the book, but it was a cool process and I’d definitely do it again…probably juicier this time. Are you planning to write another book in the future? JK: I can’t tell all my secrets…but there’s this really great idea we’ve been going back and forth with, so we might do that. On a different note that’s book related, I want to do a book for teens. It is an instructional book on how to do makeup...a beauty bible for teens, if you will. I was looking online at Amazon and in the stores and I think there’s really nothing really good out there. So I’ve been putting together a few things and have been doing some photo shoots and hopefully that will get published soon. I’d love to see that happen because I think teenagers and college students, they’re the most experimental with their looks because they’re definitely not stuck in their ways and want to try new things. So I think it’d be great to do something like that soon. Teens and college students are my big audience anyways. What can fans and aspiring beauty experts expect from you in the future? JK: Well, hopefully season two of Fashion Star. I’m planning on doing a brush line and a teen book and I’ve actually got a really cute show idea, a makeup reality show, that I’m tossing around with some producer friends of mine. So hopefully we’ll see some really cool stuff in the next year. JK: I went to Makeup Forever today, and I just saw something I thought was really cool for summer. There’s these new colors called Aqua Cream, and they’re completely waterproof. They’re really insane. They’re great for cheeks and lips and eyes. You could actually go swimming all day, and they don’t move...like I can’t even get the swatches off my hands right now! I think it’s a pretty innovative product. It’s something I haven’t really seen before…something that actually works. So you should definitely check them out, especially for summer. I think a lot of college girls would be really into these. 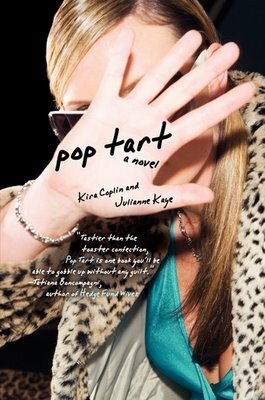 Interested in keeping up with Julianne Kaye? Follow her on Twitter and check out her blog!